Which U.S. State Is The Flattest? Compounds From What Food Have Been Shown to Suppress Coughing Better Than Codeine? People in the midwest United States like to talk about how flat things are. Citizens of Oklahoma and Kansas, for example, will regale you with stories about corn fields that stretch out flatly and as far as the eye can see. In their defense, visitors to places like Kansas often find the extreme flatness of the state and the vast expanses of fields to be visually disorienting; those states are, without a doubt, quite flat. We’d even forgive you for guessing Kansas is the flattest U.S. state on account of recent articles where researchers, tongue in cheek, compared the topography of a pancake to the state of Kansas and found that there was more elevation variation in a pancake than the state. 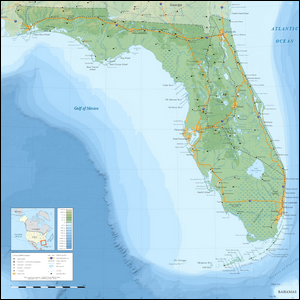 All that said, however, the flattest state in the United States, by a wide margin, is the peninsular state of Florida. Framed by the Gulf of Mexico and the Atlantic Ocean, the Sunshine State is astoundingly flat. How flat? The average elevation in the state is only 100 feet above sea level. In fact, the difference in elevation from the copious sea-level beaches surrounding the state to the highest point, Britton Hill in the Florida Panhandle, is a mere 345 feet. Not only is that not much of a rise at all, but it gives the distinction of Florida’s highest elevation existing well below the lowest elevation of many other U.S. states. The lowest point in Colorado, for example, is 3,315 feet above sea level.